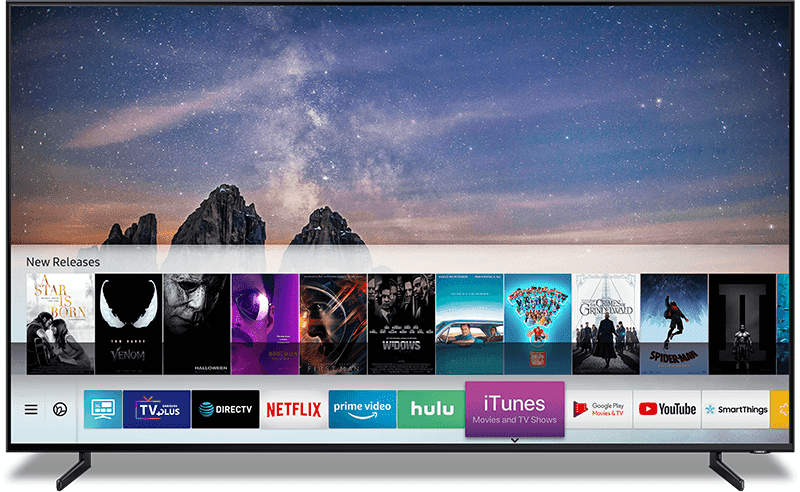 Samsung recently announced that the company will offer iTunes Movies and TV Shows and Apple AirPlay 2 support on their 2019 Smart TV models this spring. At the recently concluded CES 2019, the Korean tech giant also announced that iTunes Movies and TV Support on 2018 Samsung Smart TVs will also be made available with a firmware update. Apple iTunes Movies and TV Shows app will debut on Samsung Smart TVs in more than 100 countries. The new iTunes Movies and TV Shows apps on on Samsung smart TVs will allow Samsung users to access their existing iTunes library and browse iTunes Store to buy or rent from hundreds of thousands of movies and TV episodes like 4K HDR videos. Samsung said that iTunes will work seamlessly with their Smart TVs. Even the new Bixby and search will properly work. On the other hand, support for AirPlay 2 will be available in over 190 countries around the world. Airplay 2 will allow Samsung users to play videos, photos, music, podcasts, and more frm Apple devices directly to Samsung Smart TVs. As of writing, Samsung is the global leader in the television industry for 13 years. Samsung have developed QLED 4K and 8K TVs, The Frame and Serif lifestyle TVs, as well as other Samsung UHD and HD models. Apple and Samsung may have rivalry in the smartphone market, but both industry giants decided to partner, allowing Samsung TV users to access Apple's iTunes Movies and TV Shows app and AirPlay 2.